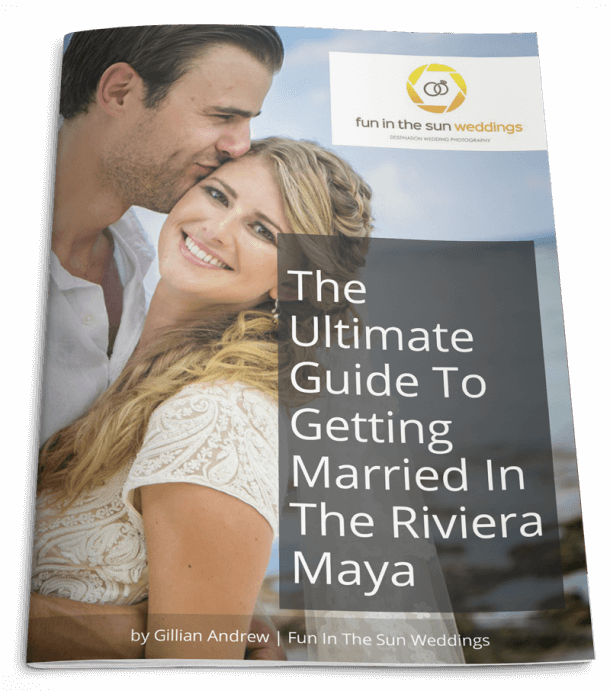 Are you getting married on the beach in the Riviera Maya, Mexico? Is this roughly what you picture when you think of your beach wedding in Mexico? The sun hangs low in the sky, casting a golden sparkle on the turquoise water. A warm, gentle breeze blows as you and your Love exchange vows to stand together through life, witnessed by friends and family, tanned and teary-eyed, in the soft ivory sand around you. Well, I hate to burst your bubble but there can be a lot of annoyances that come with a destination wedding on the beach! I’ll bet your vision does not include a sandstorm blowing your hair in your face throughout your wedding ceremony, while your fiance squirms from the sweat pouring down his back. The good news is that with a little careful planning, you can prevent your dream destination wedding from ending up as a total nightmare! So what should a beach bride consider when planning a beach wedding in Mexico? I feel it’s best to compile this as a series. 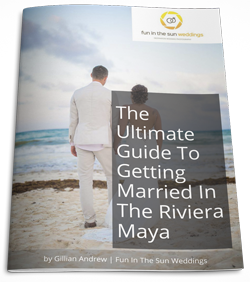 Today, let’s talk about what to wear, and what not to wear at Riviera Maya weddings. While it may look glamorous, lugging layers of crinoline and taffeta down a Mexican beach as you race to catch sunset photos won’t be easy or fun. It is HOT here in the Riviera Maya! If you sweat in a bikini, you had better believe you are going to be scorching in those layers of fluffy white fabric! For your comfort and happiness, consider a lightweight dress that flows freely in the ocean breeze, and will not collect debris from the sand. Read more about choosing the perfect beach wedding dress. Have you ever tried to stand on the sand in high heels? The two do NOT mix! Leave the heels for the honeymoon suite, and opt instead for a pretty pair of flat, open-toed sandals. Or better yet, go barefoot! With so many cute barefoot sandals to choose from, why wouldn’t you? Warm ocean breezes are romantic, but gusty winds are not. We get a lot of strong wind on the beaches of the Riviera Maya between November and April! It’s a common occurrence for our brides to wrestle with their veils. Veils come loose and fly away, or they get yanked out from frustration. So consider an updo to tame those tresses, and accessorize with fresh flowers. Need some inspiration? Check out perfect waterside hairstyles from The Knot. Please take pity on the groom and groomsmen, and let them wear comfortable, lightweight clothing! I have been witness to more than my fair share of destination brides who held firmly to their vision of her man in a tux, or similar dark suit. While that might be fine in some environments, it is simply a no-no in tropical climates. If you are getting married in Riviera Maya, Mexico, consider light cotton pants or even Bermuda shorts as attire. You will find your new husband in far better spirits on your wedding day if you do! The take away is this: You have chosen to get married on a beach in Mexico, and it WILL be wonderfully romantic so long as you respect Mother Nature. If you dress light, easy and breezy, and bring an attitude to match, then you should have a worry-free destination wedding! What will you be wearing to you destination wedding? I’d love to hear about it in the comments below! 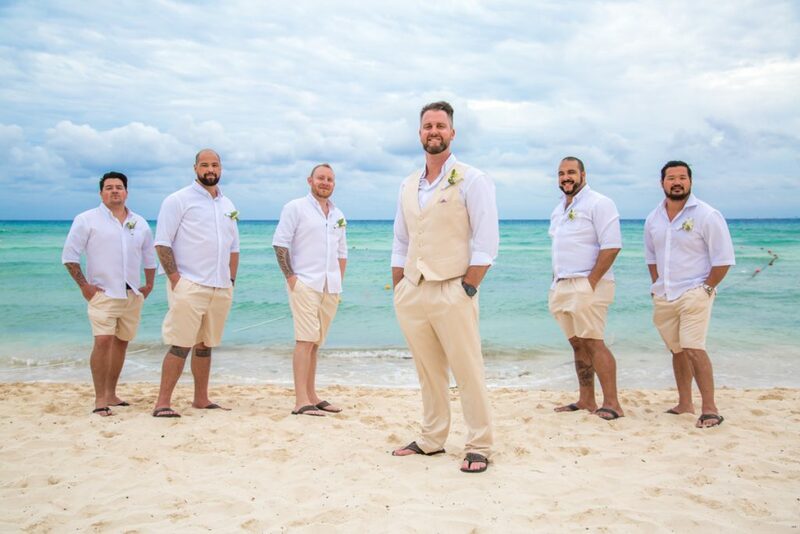 Are you looking for the best Riviera Maya wedding photographer for your beach wedding? Then contact us now! 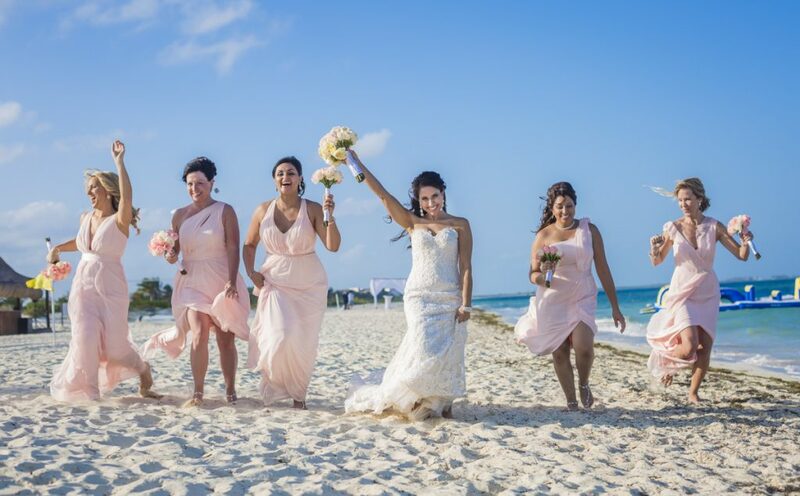 We are Fun In the Sun Weddings, for the best wedding photography in Playa del Carmen, Tulum and Cancun.